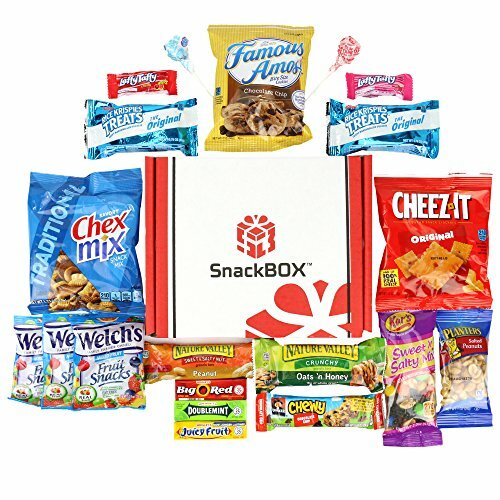 FANTASTIC FOR GIFT BASKETS - These snack care package boxes contain an assortment of single serving snacks great for college care packages, military care packages, camping snacks, back to school supplies and school snacks, finals week care package, housewarming gifts, corporate gifts, quick appetizers, yummy snacks for school lunches, snacks for work, vending machine snacks, movie snacks, airplane snacks, or even preparation for road trips! ONLY NAME BRANDS YOUR TASTE BUDS TRUST - This 8"X7" package includes 20 of the tastiest individually wrapped single serve name brand snacks we could find! This tasty treats snack set includes a perfect mix of sweet and salty flavors to win over even the hardest to please taste buds.